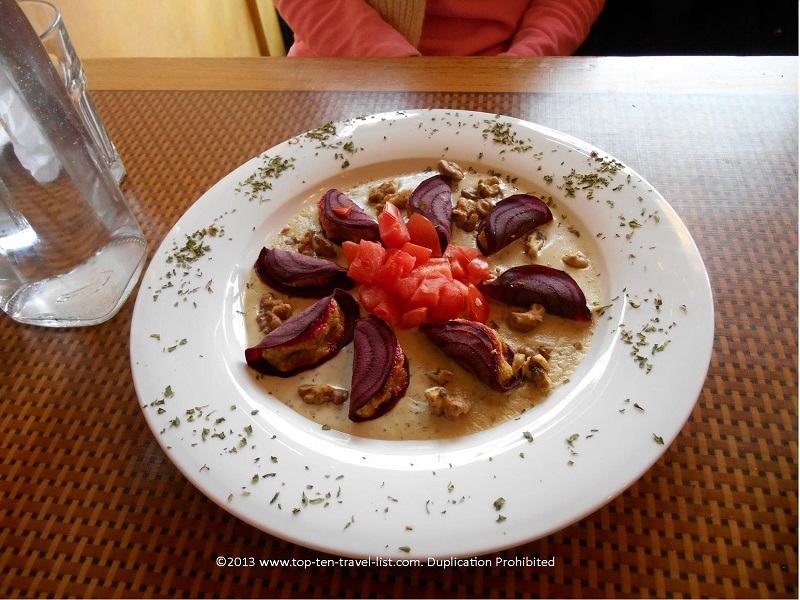 Beverly Organic Garden Cafe: Vegan Food Even Carnivores Will Love - Top Ten Travel Blog | Our experiences traveling throughout the US. Sunday afternoon, after embarking on Boston’s historic Freedom Trail, Mike and I were ready for a fulfilling healthy lunch. After walking roughly 6 miles, we were ready to sit down and enjoy some healthy food! 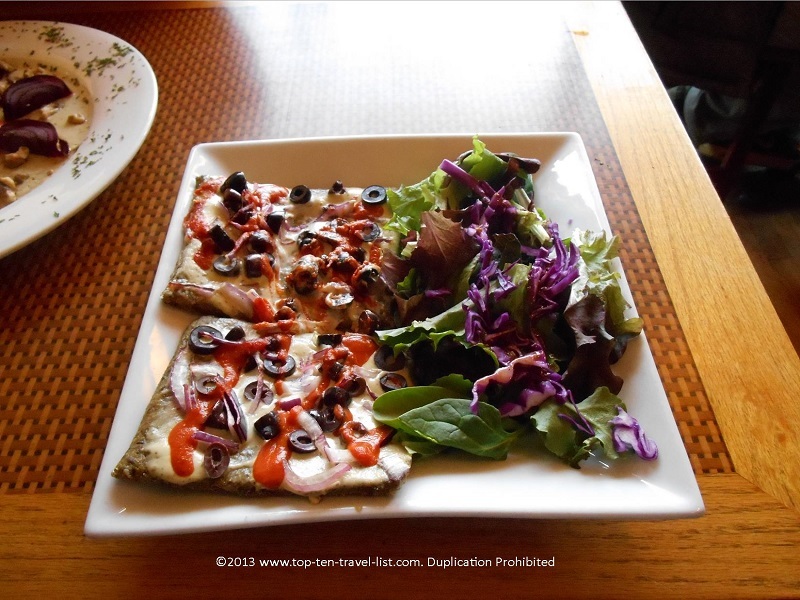 We have been trying to eat healthier and decided to stop at Beverly Organic Garden Cafe, an all vegan restaurant which has been the recipient of numerous awards over the past few years. I had heard rave reviews about the food and figured we may as well give it a shot as we would be in the area (Beverly is approximately 20 minutes from downtown Boston). This fresh, local cafe is 100% vegan. Everything is plant-based, with no animal ingredients used in anything! It is also gluten-free, which is a bonus for anyone trying to avoid gluten as well. Even better, all the produce is organic, ensuring full nutrients. Most dishes are raw or only slightly cooked, which allows you to absorb the max amount of nutrients. 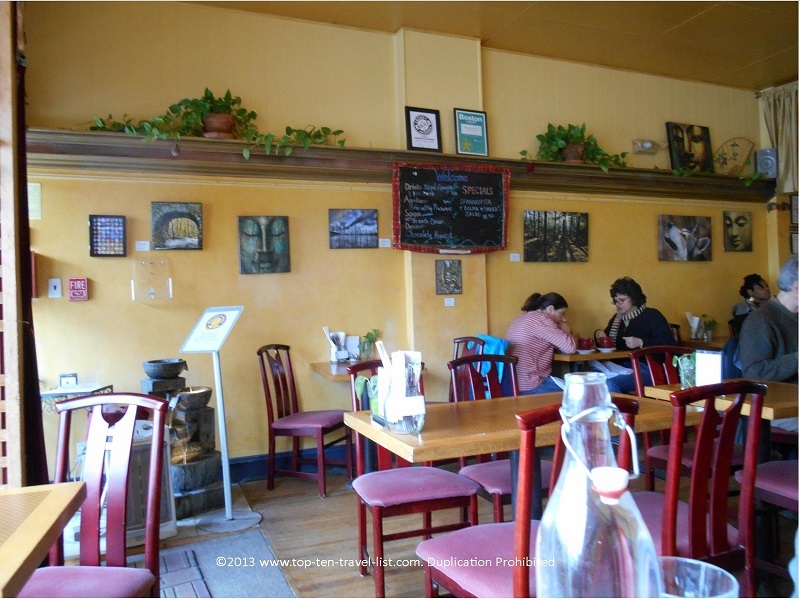 The inside of the restaurant is small like most vegetarian restaurants, although it is nicely decorated and inviting. Taking a look at the menu, we were a bit overwhelmed. Luckily, our server was able to compare the taste of different vegan cheeses to traditional cheeses to help us newcomers out. The menu had plenty of tasty looking dishes, including: several veggie bowls, veggie wraps, salads, and more. There is also a selection of house made chocolates, cakes, and other sweets for dessert. Smoothies, coffee, and tea are available to compliment your meal. They also offer brunch foods such as bagels with a variety of topping choices. For our appetizer, it was a toss up between the guacamole and chips or Chevre plate (live almond plate with chips and vegetables). We decided to try something new and ordered the Chevre plate, which our waitress informed us tasted similar to a blue cheese. We were both pleased with this new unique taste. 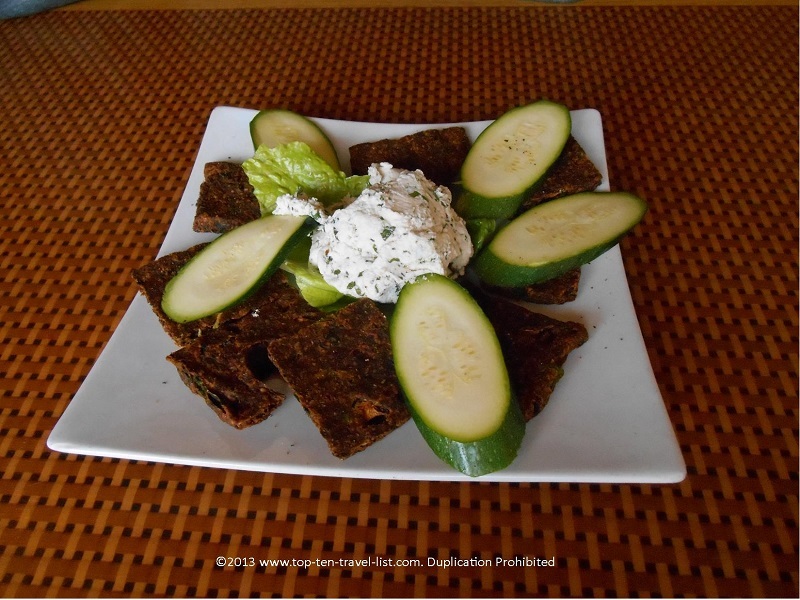 I’ve never had dehydrated flax sun crackers before, however, they were delicious and very filling! For my entree, I went with the Nut Butter Squash Ravioli, which as you can see in the picture below, was beautifully presented. I am glad that I ordered this dish, even with the hefty $18 price tag. One, it would be very time consuming to make at home. And two, it looks like it would be pretty difficult. The dish consisted of red beet shells filled with squash and topped with a creamy cashew Alfredo sauce, tomatoes, and rosemary walnuts. Wow, was this dish delicious. I didn’t even know you could make a cream sauce from cashews! The dish tasted very similar to other creamy Parmesan ravioli sauces that I have tried before switching to a dairy free diet. I highly recommend this dish to anyone! Mike ordered the deep dish pizza. We were a bit surprised when the dish came out, as it looked nothing like traditional deep dish. However, we were both pleasantly surprised with the taste. The serving looks small, however, it is very filling. There are several options to choose amongst, all with different types of cheeses and vegetables. One thing that surprised me with this restaurants over others in the state was the waiter service. I have never visited a vegan restaurant with waiter service, so this was a nice surprise. I would recommend Beverly Organic Garden cafe to anyone looking for a fresh, healthy, appetizing meal. This restaurant proves that vegan food does not have to be bland or weird. Here you will find variations on many traditional foods, instead of all strange dishes. I would think that vegans and meat eaters both will enjoy the various choices available. Do yourself a favor and take a side trip to Beverly on your next trip to Boston: you won’t leave dissapointed! 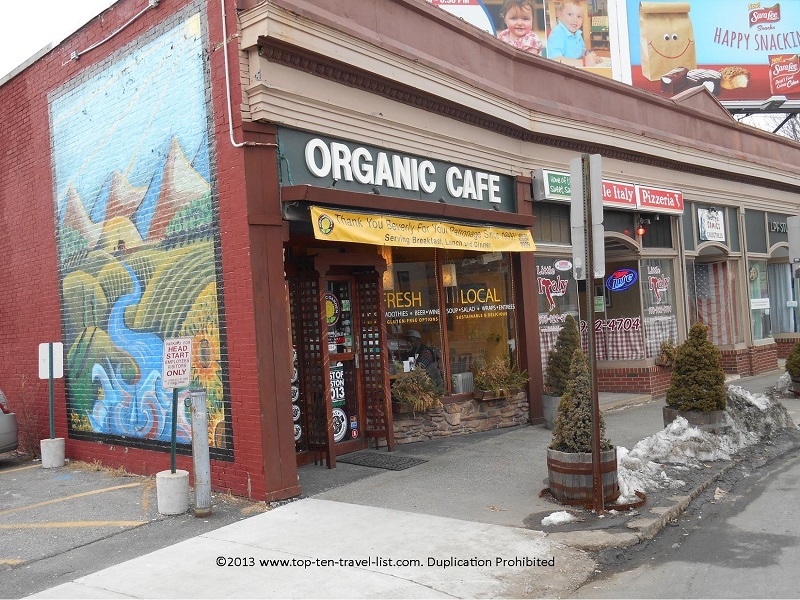 Directions: Organic Garden Cafe is located in Beverly, MA at 294 Cabot Street.